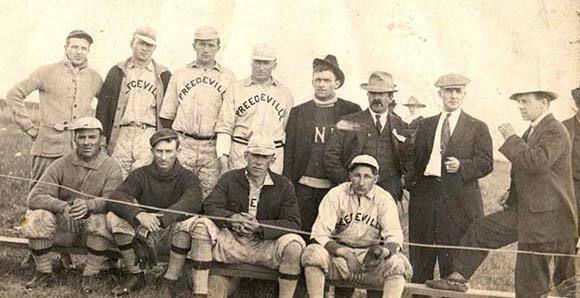 The tiny community of Stenen (population 152 in 2002) was quite a power in local baseball as a member of the Northeastern Saskatchewan Baseball League. The club won four straight championships in the early 30s, then eight consecutive titles starting in 1956 before winning two more in the 70s. 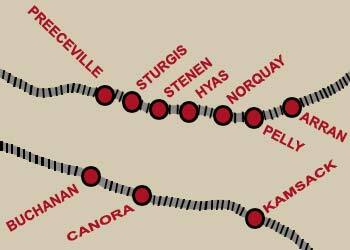 The circuit was based on communities along the old CNR lines in the eastern part of the province. There were 31 seasons of baseball from 1930 to 1975 and Stenen captured 16 titles. Canora took five and Preeceville four. Gust Koroluk (left), who suited for his last season at age 49, was one of the most prominent of the local stars winning a spot in the Saskatchewan Baseball Hall of Fame. Koroluk was inducted in 1994. The team itself won a berth the following season. Koroluk was a key player on Stenen clubs which won 10 NESBL titles from 1956 to 1975. He captured another in 1965 with Preeceville. We are indebted to Gust's son Bob Koroluk for his work in compiling a history of the NESBL. Stenen's most impressive run -- eight straight titles -- began in 1956. The team had a 19-game winning streak that season and captured first prize money in tournaments at Hudson Bay, Preeceville, Canora, Stenen and Swan River. The club finished in the money in the tournaments at Pelly, Preeceville and Sturgis. 1933 ad on the front page of the August 3rd Canora Courier announcing an exhibition double-header between the Detroit Colored Giants and the NE Saskatchewan All-Stars. There was so much interest in 1950 that the league had three divisions to accommodate thirteen teams! No player shall either directly or indirectly receive any pay for playing in a league game. And, in keeping with the times, the constitution had a section on impassable roads. The rule stated that teams had to call by noon on game day to inform they couldn't make the trip because of road conditions. (July 28,1933) Stenen won its third straight NESBL title winning a four-team tournament played at Hyas. The top four teams of the eight team loop staged a final playoff to decide the winner of the Morken Cup. Stenen defeated Pelly in the first game and Buchanan followed with a victory over Hyas. (July 24, 1935) In a four-team playoff tournament, Canora scored a pair in the 7th inning to top Hyas 3-1 in the final to capture the league championship and the Morken Cup. Skywork held Hyas to five hits in going the route for the winners. In the opening game, Hyas upset Stenen 7-5. Canora reached the final by defeating pennant winning Buchanan 4-0 as Chopty fired a four-hit shutout to beat Nick Dergousoff. (July 24, 1936) Hyas shaded Stenen 3-2 Friday in the playoff tournament to capture the Moken Cup, emblematic of baseball supremacy in the Northwestern Saskatchewan League. Hyas shutout Sturgis 4-0 in the first game and Stenen took 10 innings to elimiante Pelly 4-3. (July 16, 1937) Stenen regained possession of the Morken Cup and the Northeastern Saskatchewan title defeating Pelly 2-0 in the playoff tournament final. Stenen had earlier beaten Sturgis 2-1. Pelly reached the final virtue of a 6-2 win over Canora. (May, 1948) Membership for 1948 of 16 teams pushed the N.E.S.B.L. into a three-division league at the annual meeting of the league in Kamsack on Sunday. Enthusiasm shown by the delegates and others promised a most successful year for the league ... membership is as follows; North, Arran, Pelly, Hyas, Pelly Indian agency, Kamsack Kolts; East, Togo, Runnymede, Kamsack Cyclones, Stoney Creek, Verigin; West, Stenen, Sturgis, Preeceville, Canora, Buchanan, Mikado. In 1949, in the fourth season of the NESBL, the league had 15 teams ! (July 22, 1949) At Mikado Friday, Stenen evened the final series at a game apiece with a 6-3 victory. Stenen scored a pair in the opening frame as Tanton led off with a double and Kurliak and Shostle followed with singles. Mikado got on the scoreboard in the second when Mike Gabora doubled to bring in Koroly and added another in the third as Horkoff belted a triple and scored on an overthrow to third based. Stenen took the lead again in the third with a singleton and plated two more in the fifth which saw Albert Gabora being replaced on the mound by brother Ernie who took over with the bases loaded an only one out and allowed just one run to score. Mikado fans let out a roar in the sixth inning when Metro Prokopetz slammed a homer. Stenen had 12 hits to 8 for Mikado. (July 26, 1949) Stenen won the N.E.S.B.L. finals and the Morken Cup by defeating Mikado 13-0 in the third of a two-out-of-three series. Stenen broke a 2-2 tie with an 8-run outburst in the 5th inning. (May 11) The Kamsack Times reports 13 teams will play in three divisions of the Northeastern Saskatchewan Baseball League. The schedule calls for the season to run from May 14th to June 10th. (June, 1950) Kamsack Cyclones won the Saskatoon exhibition baseball tournament when they defeated Sceptre 8-3 in the final game Saturday night. (June 20) Kamsack Cyclones edged Yorkton West Ends 2-1 as Ken Mohr pitched a five-hitter to best Merv Campbell for the win. Dave Whatley led the offense with three hits and made a pair of outstanding plays in the field. (May, 1951) Stoney Creek Sparks trounced Togo 9-3 behind the five-hit pitching of Clifford Kraft who fanned six while allowing just one base on balls. Sparks had 14 hits against three Togo hurlers, Poitra, Nabe and Ross. Jack Strelioff, Sparks new first baseman, broke the game open in the 6th inning with a bases loaded single driving in three runs. (May 20, 1951) Togo took advantage of six Stoney Creek errors to eliminate an 8-1 deficit and edge the Sparks 12-11 on Sunday. "Scotty" Ross cooled off the Sparks after the club had run up eight runs in the first two frames. Bill Chypyha knocked in seven runs for the losers with two doubles, a single and a walk. Togo had nine hits off Clifford Kraft and Mike Berezowski. Stenen followed up their 1958 championship with victories in both 1959 and 1960 to begin a string of seven consecutive NESBL titles. The 1959 NESBL Champs. Front row - Buck McGergie, Bob Sundeen, Mervin Secundiak. Back row - Mike Letwinka, Don Kachman, Alex Fedorchuk, George Bellows, Harry Krotenka, Gust Koroluk, Isaac Kurulok. (Aug 27, 1961) : D'Arcy Loster pitched Stenen to top prize of $200 in the Yorkton tournament. Loster allowed just one run in 15 innings, including a five-inning one-hitter in the final, a 2-1 victory over Melville. Stenen had earlier downed the Combines 4-1, Hohenloe 7-0 and Kihaly 4-0. A crowd of 1,350 watched the final. 1963 poster advertising the exhibition game between the Satchel Paige All-Stars and the Stenen All-Stars. Paige's nine won, 7-0. (August, 1974) The Stenen senior baseball team bombed Burgis Lakers 25-9 Monday in the fourth game of the best-of-five North-Eastern Saskatchewan Baseball League final series to win the championship three games to one. .. Stenen brook the game wide open in the fourth inning with ten runs on four hits and seven walks. Burgis replied with five runs in the bottom of the four but eight Stenen runs in the fifth gave the winners a 22-7 lead and assured them of the championship. (Aug 27, 1975) "Stenen captured the championship of the Northeastern Sask. Baseball League for the second straight year, with an 11-6 victory Sunday at Canora. The fourth and fifth games of the series were played on the weekend, with Canora Supers scoring a come-from-behind 7-6 win at Stenen Saturday. Bob Koroluk also put together some highlights of the Hyas baseball club, the NESBL champs in 1930 and 1936. 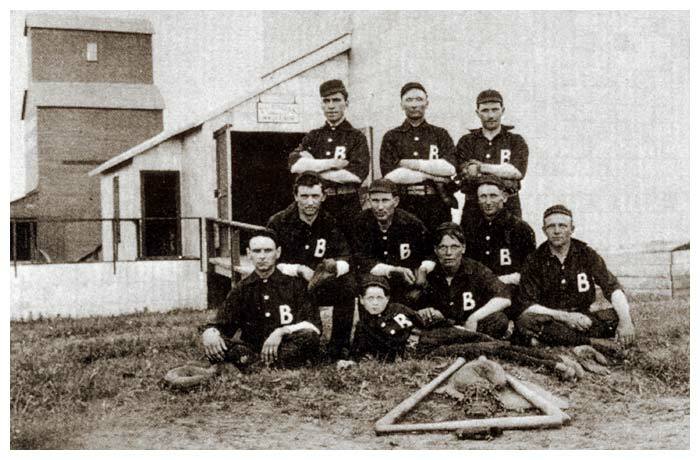 Allen Yewel coach/manager, Anton Belous pitcher, Eric Quist catcher, Matty Gibney 1st base, E. Quist 2nd base, Russell Johnson 3rd base, Steve Yurkiw short stop, Jim Lisoway left field, Ted Fiala center field, Andrew Bellous right field, Alf Hanson batboy. Following the 1930 season, strong Stenen teams were able to capture the league championship 4 seasons in a row, then in 1935 Canora stole the championship away from the dominant Hyas and Stenen teams. 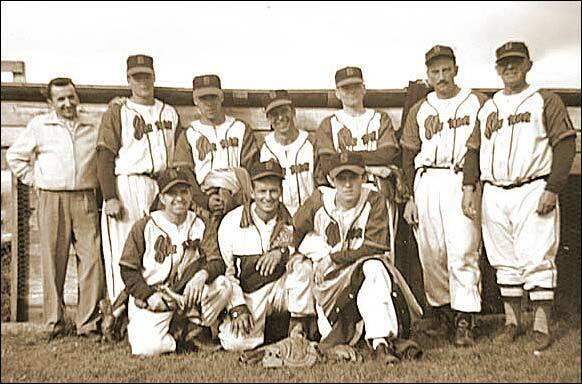 In 1936 Hyas again dominated baseball in the area and were unbeatable as they again claimed the NESBL Championship. Other baseball players who were instrumental in Hyas's success were: Geo Lisoway catcher, Paul Kalturnyk catcher, Pete Kukura pitcher, Pete Yatsura short stop, Vic Lisoway 3rd base, Nick Yatsura Center field.